PHOTO: Allen Ramsey, DWCPhoto.com. 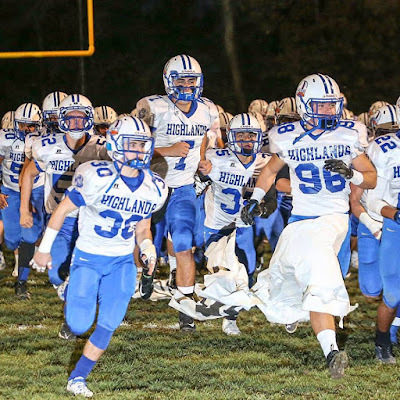 The Bluebirds enter the playoffs seeking their ninth straight championship game appearance. They've won seven state championships in the last eight seasons. FTMSports.com writer, G. Michael Graham takes a look at the 5A playoffs. We looks at each game in the first round and every likely matchup throughout the playoff bracket. We have given each game a "confidence" score. A score of 10, means we are absolutely sure it'll happen to a 1, which means we aren't feeling great about the prediction. Bluebirds have won 23 straight first-round contests. Montgomery County over Dixie Heights. Alex Harvey, a 1,202-yard rusher, could have a big night for the Indians. Madison Southern over Grant County. Eagles exit tough district with Pulaski County and win surprising first-ever district championship. Covington Catholic over Anderson County. Colonels find way to win close one over Bearcats at Dixie Heights. Bluebirds contain Harvey and company. Covington Catholic over Madison Southern. Colonels go on road again and record close second round victory. Bluebirds always pick things up against Colonels and this will be no different. Pulaski County over Letcher County Central. Veteran Head Coach John Hines and staff won't let defending 5A state champs overlook the visitors from the mountains. Harlan County over Lincoln County. It's tough to leave Harlan with a victory in the playoffs. Warriors right ship in first round of playoffs. North Laurel over South Laurel. Battle of London heavily favors rising Jaguars. Pulaski County over Harlan County. Maroons should be too much for Black Bears. Edge in tight game goes to team with tougher schedule. Albeit a lot closer than regular season, Maroons still get it done. Christian County over Barren County. Bowling Green over Owensboro Apollo. Red Devils are determined to get back to state championship in higher class. Bowling Green over Christian County. Colonels may give Purples fits, but not enough to pull the shocker. Red Devils win rematch at home and avenge lone loss of regular season. South Oldham over Louisville Southern. Louisville Fairdale over Bullitt East. North Bullitt over Louisville Doss. Louisville Fern Creek over Bullitt Central. North Bullitt over Fern Creek. South Oldham over North Bullitt. A lot of unknowns in this region. Maroons have been more consistent than Bluebirds throughout season. Red Devils do not need lucky bounce this time. Maroons use experience to win consecutive crowns.